Yeah, this. Here's a couple pics of my recent build which has a similar configuration except my rad is in front and I exhaust out the top and back. I also have a fan on the bottom as an intake blowing air up towards the GPU. 4 total intakes and 3 total exhausts. The hottest my 2080 ever gets under max load gaming is around 75C, and that's with a pretty aggressive overclock and the stock fan curve. The front intake fans are controlled by Corsair Link and ramp up based on coolant temp to 80% or so at 33C (which I usually don't reach gaming). I have my exhaust fans controlled in the BIOS and set to ramp up based on CPU or GPU temp (maxing out around 80% over 75C), except for the bottom intake fan which only looks at the GPU temp. I use the thermal probe on the back of my GPU die to get something close to the GPU temp for the BIOS. I have all the fans going at a minimum of 40% at all times (might as well since they're really quiet). Last edited by tostitobandito; 03-20-2019 at 01:53 PM. @Sriram_Thodla regardless of having your GPU temps under control now, I still recommend that at some point you change your top radiator fans to be as exhaust and see the results. Even with only one intake on the front you may see improvements in CPU/GPU temps. Just took delivery of my EVGA blower 2080. Thing runs warm for my blood, but i will probably put a uni block on it soon enough. I am amazed and a little disappointed at the same time by the overclocking ritual for these new cards. My last cards were SLI 980s, and I had a real blast overclocking them and baking in final clocks, and I got a solid performance boost with them. With OC scanner, I guess the days of manual overclocking are essentially gone. Just hit a button, and it does it for you. Its neat, and really easy...but I am going to miss valley benchmark with nvidiainspector open on a second monitor. I was surprised that I am not able to hold 60 FPS in any of the games that came bundled with the card without lowering details. I thought for sure this would be a good card to crank up details at 4k. It is still a major improvement over my 980s, particularly in titles that dont like SLI (which is the entirety of my VR library), but not quite a 4k card. I had the same reaction to the 2080 performance. I thought it would be faster than it was. On ultrawide 1440p I've had to run everything at slightly less than max which is of course better than before but still. Finally ordered one of the EVGA 2080s last night so I can burn my SLI 980s. Or give them to a friend. I'm looking forward to the slight bump in FPS but mainly the fact I don't have to deal with SLI anymore. Just made the EXACT same upgrade. The extra VRAM is great, not worrying with SLI is great. It isn't a 'crank it to the max at 4k" card, but with a little fiddling it does quite admirably on everything I have played. I am debating using the step up program, since I am already this deep in my pocket for frames. 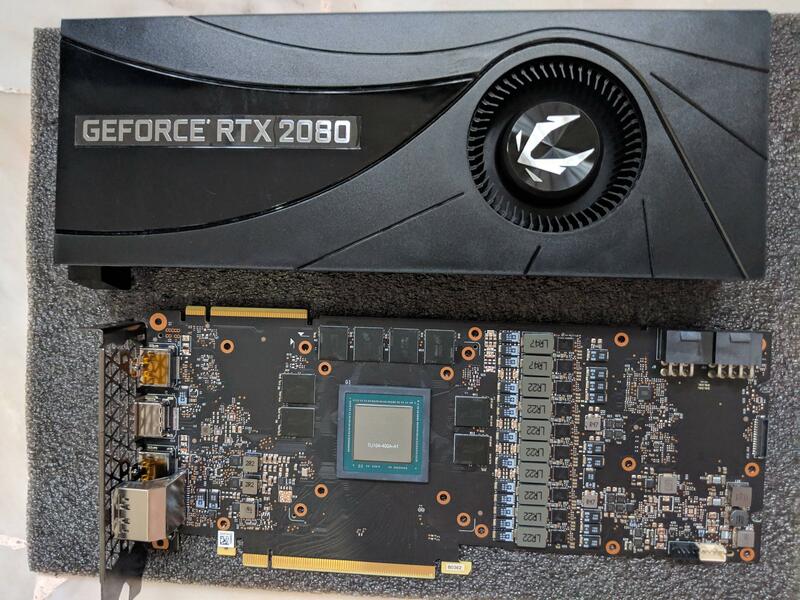 2080 was never advertised as "Ultra 4K" card guys. And to be honest, it's 2019, no one should just set "Ultra" on games anymore unless you don't care about maximizing your setup and invested $$$. There's a bunch of combined settings that if set to Ultra they can drag your FPS down by 20+, but while actually playing the game you barely can see any difference if they were at High or Medium. I came from a 980 TI and the performance jump is awesome. I agree, most ultra settings are barely noticeable while playing. Maybe it isn't that I was expecting an xx80 card to play everything cranked up, but as hard as I opened my wallet I feel like I should! GPU prices are insane. I know these chips are big die, with transistor counts previously unheard of in a consumer product...but it just doesn't feel like it performs as well as it should for the price and transistor count.